Welsh poet Dylan Thomas came to New York to narrate his play “Under Milk Wood” in 1953. Before long he was romantically involved with the play’s assistant director, Liz Reitell. 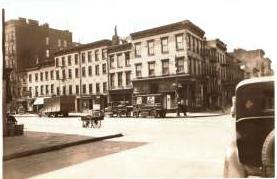 The two shared an apartment in the legendary Chelsea Hotel on 23rd Street. 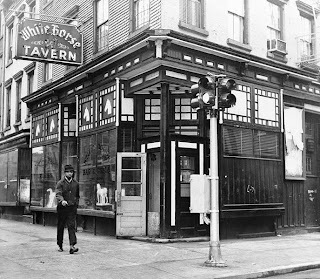 It was during that same year that Scottish poet Ruthven Todd changed the life of Dylan Thomas by bringing him to a blue collar bar in Greenwich Village – The White Horse Tavern. 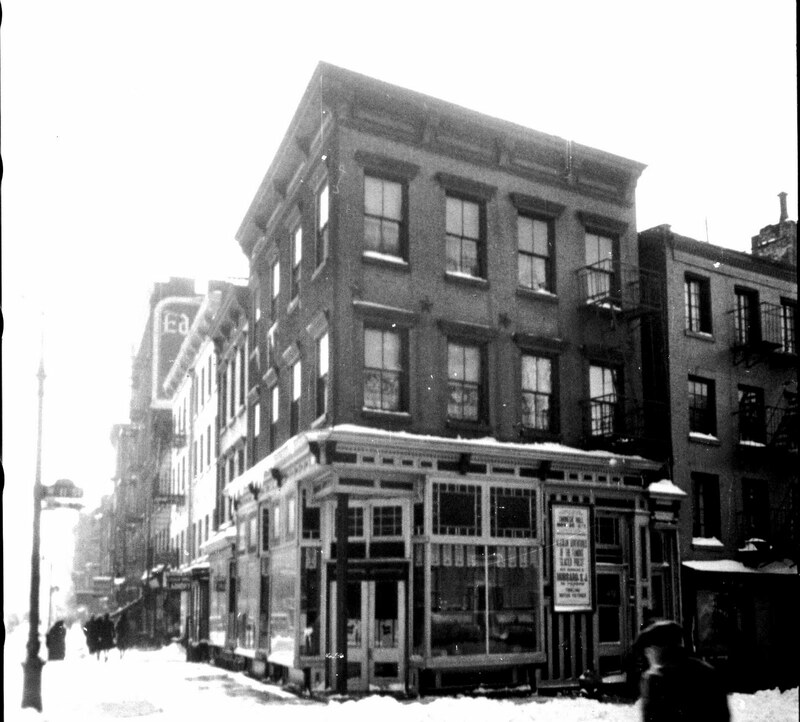 Located on Hudson Street at the corner of 11th Street, the tavern had opened in 1880 a few blocks from the Hudson River piers. Generations of dock workers and laborers finished their day at its commodius bar crafted from a solid piece of mahogany under the pressed tin ceiling. It immediately became Thomas’s drinking spot of choice. His last visit to “The Horse,” as he called it, was on November 5, 1953. Drinking whiskey with a gusto unusual even for him, he became ill and returned to Chelsea Hotel where he fell into a coma. Four days later – just six days after his 40th birthday – he died of chronic alcohol poisoning at St. Vincent’s Hospital. The popular version of the story recounts his last words being “I’ve had eighteen straight whiskies, I believe that is a record.” The recollection of the bartender puts the number significantly lower and the authenticity of the quotation is doubtful. Nevertheless, Thomas’ passing started a pilgrimage of poets and artists to the White Horse. 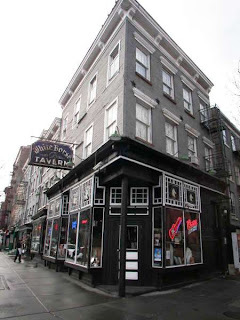 The stools where longshoremen drank ale and beer were suddenly taken over by the likes of Norman Mailer, James Baldwin, Jack Kerouac, Bob Dylan and Jim Morrison. 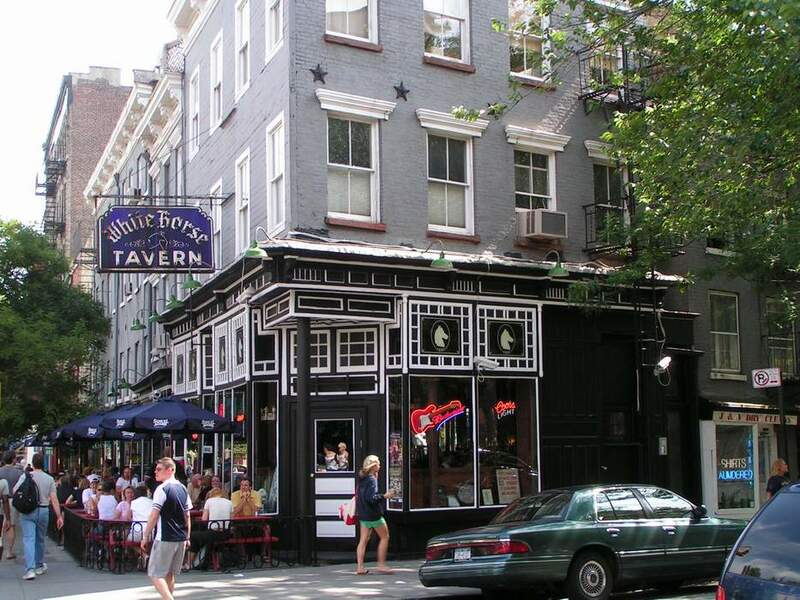 In the 1960s Beat Generation poet Alan Ginsberg drank here, along with Frank O’Hara. Later artist Andy Warhol could be found here, as well as Frank McCourt, author of Angela’s Ashes. On the night that John Belushi died, Dan Akroyd came in around closing time and bought drinks for the house. Through it all the White Horse has remained remarkably unchanged. Any vintage photograph of the tavern looks nearly identical to one shot today. The three-story Victorian vernacular building is as unpretentious on the exterior as it is inside. In a surprising reversal of convention its front facade on Hudson Street -- normally the side meant to impress -- is clapboard while the 11th Street side façade is brick. I am going to visit NYC in just a few days. I am originally from upstate NY & ran away from home in 1968 to San Francisco to join the hippies. I lived in SF for 25 yrs. & now live North over the Golden Gate Bridge. Only one of my 3 children have visited NYC but I hope they all will one day. I can't wait to see the White Horse Tavern, hang out of the late Frank Mc Court, my favorite author. I am excited to sit at the very same bar where he sat in the 50s after a day's work on the docks, and later as as high school teacher on Staten Island. I am also anxious to visit a few of the many Irish Pubs in Manhattan. I have only been to Paddy Riley's & loved it. They have great music. Sounds like your story is as interesting as some of the more famous characters who have hung out at the White Horse. Check out my blog for other vintage watering holes. You might get ideas for other places to bend your elbow!